The only way is a rescue dog. 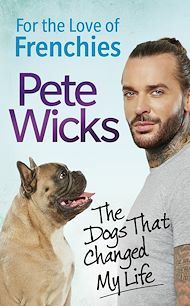 French Bulldogs are the UK’s most popular dog breed, and nobody loves them more than Pete Wicks. Although he’s most famous for his appearances on The Only Way is Essex, he’s never happier than when he’s with his best friend – no, not James Lock – his French Bulldog Eric. But their story hasn’t been all walkies and biscuits. In 2016, Pete was devastated to suddenly lose his adored French Bulldog Ernest at just three years old. The Wolfpack was torn apart. Left to pick up the pieces with Eric, he realised that he knew very little about the breed and the reason why Ern died so young. In honour of his old pal, Pete teamed up with animal charities and uncovered the shocking unregulated breeding and illegal importation that led to the life-threatening illness Ernest suffered from. And the problem is widespread. But if you want one of the best companion dogs you could ever own, a pup that is affectionate and playful (or some would say mischievous), then a French Bulldog is perfect for you. Here Pete reveals the many tips he’s learned for a happy life with a Frenchie, and how we can all help to eradicate the problems facing the breed. Most touchingly, for the first time he bravely recounts that love and grief we all feel for a special dog. This is a book that EVERY dog lover needs to read.